Sharing is a good way to give a few people access to your dashboards and reports. Power BI also offers several other ways to collaborate and distribute your reports. With sharing, you and your recipients need a Power BI Pro license, or the content needs to be in a Premium capacity. You can share a report with coworkers in the same email domain as you, from most places in the Power BI service: your Favorites, Recent, Shared with me (if the owner allows it), My Workspace, or other workspaces. When you share a report, those coworkers you share it with can view it and interact with it, but can't edit it. They see the same data that you see in the report, unless row-level security (RLS) is applied. What if you want to share a filtered version of a report? Maybe a report that only shows data for a specific city or salesperson or year. Try creating a custom URL. The report will be filtered when recipients first open it. They can remove the filter by modifying the URL. Open the report in Editing view, apply the filter, and save the report. 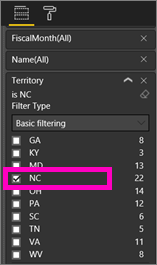 In this example, we're filtering the Retail Analysis sample to show only values where Territory equals NC. The field must be of type string. The tablename or fieldname values can't contain spaces. 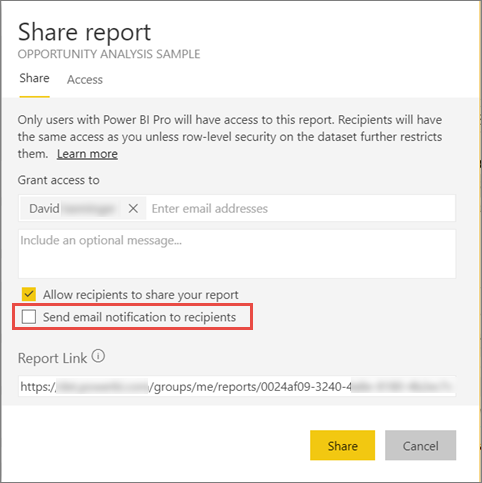 Share the report, but clear the Send email notification to recipients check box. Send the link with the filter that you created earlier. Have feedback? Go to the Power BI Community site with your suggestions. How should I collaborate on and share dashboards and reports? More questions? Try the Power BI Community.